KAS BANK is the first General Clearing Member of Euronext that is able to provide clients of the three underlying Euronext exchanges with its services from one portal instead of from three different connections. KAS BANK commenced its clearing and settlement services on Euronext Paris in November, after successfully completing a pilot phase with securities broker Eduard de Graaff. Euronext members can now trade on all three Euronext exchanges and have their positions cleared and settled using KAS BANK as their General Clearing Member. As from February 2002, KAS BANK can provide all its clients in Europe and outside Europe with this service. In the coming months, KAS BANK will conduct several pilots in order to gain further experience in the French infrastructure. Due to its highly automated services, KAS BANK can provide this service without any further increase in costs.KAS BANK now offers its clients one clearing and settlement protocol for the Euronext exchanges in Amsterdam, Brussels and Paris. In connection with this, KAS BANK introduces its new, automated collateral system; clients can now reduce costs by using their collateral surplus for other liabilities. Aside from these expansions, KAS BANK also provides one uniform reporting structure for the three Euronext markets. Expectations are that clients will have a better insight into the increased transaction volumes and turnover around the first quarter of 2002. For Global Custodian article on KAS BANK (previously KAS Associate) see “KAS’s Custody Niche Across the North Sea”, IT 2001. Despite the exposure of its threat to build a European central counter-party (CCP) as a bluff, the European Securities Forum (ESF) has decided not to implement the sunset clause in its constitution. The clause, which would have wound up the ESF in April next year unless members decided otherwise, was overruled at a meeting on 30 November at which members renewed their “commitment to a pan-European capital market.” ESF is also promising “new arrangements to enhance the strength of its membership and the role of its own executive.”This is understood to mean the recruitment of senior investment bankers to the executive committee of the ESF; the establishment of a permanent secretariat; and especially the broadening of the membership of ESF to include non-investment banking interests such as fund managers, custodian banks securities depositories and especially the smaller players in various national markets. Details will emerge from a full meeting of members, which is now unlikely to be held before the New Year.Though an ESF spokesman describes broadening the membership categories into new areas as “pure speculation,” the step does reflect the relative failure of an investment bank-led ESF to mould the European securities market infrastructure in its own image. The promise to appoint more senior figures to the executive committee of the ESF recalls the embarrassing collapse of the ESF threat to build their own single European CCP if the London Clearing House (LCH), Clearnet and Eurex Clearing did not build one for them. At the meeting of the EuroCCP Working Group of the ESF on 28 June, the members simply refused to put up the money. As the minutes of that meeting put it, “there is a risk to the reputation of the industry if it appears to lose interest in a development for which it has lobbied the authorities … [a decision by ESF] to abandon its objectives it could damage its reputation and prospects for successful lobbying in the future.”Considered in that light, the decision to override the sunset clause was more or less inevitable. The chief focus of interest in European CCP developments today, of course, is the future of Clearstream – currently the subject of competing bids from Euroclear and Deutsche Borse. The ESF announcement today says the organisation “continues to believe strongly in a horizontal structure which separates the governance of clearing and settlement from trading platforms … It is important to maintain vigorous pressure for horizontal consolidation.” This puts ESF squarely in the Euroclear camp (whence it came, critics might say) in the battle for control of Clearstream between Deutsche Borse and the Brussels-based clearer. But ESF will also continue to lobby for the removal of the barriers to efficient cross-border clearing and settlement in Europe, itemised in the recently published Giovannini Group report.See Global Custodian Pre-Sibos issue Summer 2001 (“Three’s Company”, pages 42-47). For the first time since its creation in 1996, Fintuition Ltd, the London-based specialist Securities Finance training company, is to offer its courses in North America. In 2002, Fintuition will be offering its Global Collateral Management course in February and its Equity Finance & Structured Products course in April with both courses being run for a second time in September. All the courses will take place in NYC and will be limited to 16 participants each.Alison Brooks, Managing Director, said “I am pleased to be bringing our specialist training courses to my home country and we are confident that the courses will be as well-received in the US as they have been in Europe”.Alison Brooks and Fred Gander from Dewey Ballantine will be course directors for the Equity Finance course and Christian Karg from JP Morgan in London will be director of the Global Collateral Management Course. See “KAS’s Custody Niche Across the North Sea”, pp 16-17, Global Custodian, IT Issue 2001.
on investment companies, including monthly reports on five broad categories of mutual funds. Hedge funds proved a better bet for investors in 2001 – with the average US hedge fund rising by 5.6% net of fees over the year, according to data from Van Hedge Fund Advisors International. Offshore hedge funds performed even better than their domestic counterparts, averaging a 7% net gain for the year. The longstanding rumour that Tony Kirby, executive director of the Global Straight Through Processing Association (GSTPA) during its fund-raising stage, was poised to leave bolero.net – the faltering trade documentation standardisation project backed by SWIFT and the Through Transport Company – look set to be confirmed this coming Tuesday. Kirby takes up a new position as head of STP Marketing Activity at Reuters on 28 January. It means Kirby re-joins the firm at which he made his debut in the securities industry, before joining SWIFT and then the GSTPA. His job will presumably be to Forge better links between the Reuters information businesses and its transactional services. There is an obvious opportunity for Reuters to provide pricing and other data to the GSTP/axion4 and Omgeo virtual matching engines. At Bolero, Kirby was director of Global B2B services, and a member of the executive committee. Figures published today by Bankersalmanac.com include the surprising revelation that the Sumitomo Mitsui Banking Corporation, the top-rated agent bank in Japan in the 2001 Global Custodian survey of major markets, is now the biggest bank in the world. The Japanese bank, enlarged by the merger of Sumitomo and Sakura banks in April last year, sports total assets of over $905 billion. Deutsche Bank, which headed the leaguer table last year, is second with assets of $883 billion. Last time the table was drawn up, Sumitomo Mitsui did not even make the top ten.Another Japanese bank, Bank of Tokyo Mistsubishi, he Japanese triumph is vitiated by the possibility that many of the assets are in fact liabilities, in the shape of unresolved bad debts, and the fact that Sumitomo Mitsui must re-pay Yen 1.5 trillion borrowed from the government as part of its re-capitalisation programme. These considerations apply across the Japanese banking sector, whose combined assets of $7.9 trillion make Japan the biggest banking sector in the world, ahead of Germany ($6.5 trillion) and the United States ($4.6 trillion). Interestingly, the top ten in the Bankersalmanac.com league table includes only one American bank: Bank of America. The other seven are all European. SEC will allow the creation of a scripless securities clearing and settlement infrastructure for the commercial paper market if additional safety nets are created. On the condition that additional safety nets are created to ensure transparency, the Securities and Exchange Commission (SEC) said it will allow the creation of a scripless securities clearing and settlement infrastructure for the commercial paper (CP) market. Following a joint presentation made by the Investment Houses Association of the Philippines (IHAP) and the Philippine Central Depository (PCD), the corporate regulator approved in principle the proposed scripless securities settlement of CPs. SEC chairperson, Lilia R. Bautista, noted that while the commission expresses no objection to the proposed system, it will ask the proponents to submit regular and detailed reports on the issuers and the investors that go through the scripless system. IHAP and PCD said the SEC’s endorsement would encourage financial institutions and investors to use the proposed system for outstanding CP issues. Under the proposal, PCD will create the book entry system, providing participants with individual accounts constituting each participant’s CP holdings for one or more issues. on inadequate settlement infrastructure for European commercial paper market. A full analysis of funds is being supplied by the FT to Fund Managers, IFAs and Fund Supermarkets for publication and internal analysis. Stephen Hill, chief executive of the Financial Times Group commented: “With the growing number of funds available, and the current turbulence in global stock markets, FT Fund Ratings will provide an easy to use guide to risk, charges and performance. FT Fund Ratings builds on our global reputation for impartial financial information by offering independent analysis from a source that is trusted by investors and professionalsalike. ” “This unique ratings approach from the FT Group will be the only fund analysis service to focus on three key criteria for investors in one system, examining the ISA, pension and PEP markets in a thorough yet easily comprehensible format.”FT Fund Ratings allows investors to identify the risks associated with funds and provides a transparent guide to fund charges, giving the individual investor a better understanding of their fund portfolio. Christine Farnish, Consumer Relations Director at the Financial Services Authority’s (FSA) commented: “The FSA actively encourages initiatives that seek to enhance the transparency and accessibility of financial products. We therefore welcome this initiative and shall watch developments with the greatest of interest.”FT Fund Ratings have been produced in conjunction with Fitzrovia International, Advanced Portfolio Technologies and FT Interactive Data. Figures from Combinaed Actuarial Performance (CAPS) presage another dent in the ad valorem earnings of custody banks. According to CAPS, the average balanced pension fund had a second year of falling returns in 2001, down 11.9 per cent. This is the first time there have been two negative years in a row since 1973/74. While equities, globally, produced double-digit negative returns, fixed income (3.0%) and property (5.6%) provided some solace with positive returns. UK Equities recovered in the fourth quarter of 2001, but this was not sufficient to reverse the losses of the earlier part of the year. However, with the UK Equity Standard median for the year at -13.1%, compared to the FTSE All-Share return of -13.3%, just over half the funds in the survey beat the index after fees. The relative results for funds in the UK Smaller Companies section were even more encouraging with a median of -14.5% compared to the index of -16.9%.Overseas Equity funds provided the biggest disappointment with a median of -16.8% compared to the index return of -14.1%. This was due to funds favouring European investment over North America, which performed relatively better. For the five years ending 31 December 2001, returns on UK and Overseas Equities were 7.3% and 9.4% pa respectively. Five years ago, the same figures were 16.1% and 12.1% pa. While equity returns have been considerably lower recently, volatility levels have nearly doubled. Tracking errors for many actively managed UK Equity and Balanced funds have increased substantially in recent five-year periods. In contrast, risk on fixed income and property has declined while their returns have improved relatively.This volatility in the markets has reduced the number of funds managing to outperform their section median in each of the last five years. In the equity and balanced sections, it is rare for more than one fund to have achieved this. Over the year, Fixed Income weightings in Balanced funds rose from 12.5% to 13.6%. Despite this increase, allocation to fixed income still remains below its 1998 peak of 15.6%. Cash fell from 6.6% to 4.7%, while Property allocations hardly changed at 1.1% at the year end.Average equity weightings in Balanced funds increased over the year, from 79.6% to 80.3%. This is surprising, given the relatively poor performance of equity markets. Within this, average holdings in UK Equities fell, from 54.0% to 53.3%, while the allocation to Overseas Equities increased from 25.6% to 27.0%.While the allocation to Overseas, as opposed to UK Equities, is increasing, the proportion invested in Europe has declined recently. Three years ago, Europe represented 60% of Overseas Equity allocation. This has now fallen to 42%. In addition, European Equity allocation within Pan European (UK plus Continental) Equity funds has fallen over the last 18 months. CAPS Pooled Pension Fund Database covers the largest and most representative sample available to the trustees of UK pension funds. We currently cover 83 separate asset managers who manage over 199 billion in pooled funds, both balanced and specialist. Verticals versus Horizontals: Who Cares Who Wins?
) – to negotiate a merger with Deutsche Borse alone risked alienating the investment banks which have campaigned for a merger between the Luxembourg-based clearer and Euroclear. London-based investment bankers have huffed and puffed repeatedly that they would switch their business to force a merger if they did not get what they wanted by more reasonable means. On 10 January JP Morgan Chase made good on that threat. The bank confirmed that it intended to shift assets worth $150 billion from Clearstream to Euroclear, and that Tom Swayne had resigned his seat on the board of the Luxembourg-based ICSD. The bank made clear that its decision was a protest at the decision by Clearstream to enter exclusive negotiations with Deutsche Borse, with a view to creating a vertically integrated business combining a trading platform, a central counter-party and a depository. “JP Morgan Chase supports a horizontal solution to the clearance and infrastructure question, while Deutsche Borse advocates a vertical solution,” read an official statement from JP Morgan Chase.On 21 January it emerged that UBS was also threatening to move its business across the Ardennes. The threat was less explicit than that issued by JP Morgan Chase, since its realisation depends on the outcome of the merger talks between Deutsche Borse and Clearstream, but the implication was obvious enough. “UBS AG supports the horizontal approach to European capital markets, including separation of ownership and control of clearing and settlement from exchanges,” it read. “We were disappointed that the Board of Clearstream decided to terminate merger discussions with Euroclear and pursue exclusive merger talks with Deutsche Borse AG. Thus, UBS has indicated to Clearstream and Deutsche Borse that it intends to move some of its assets. UBS action is dependant in part on the outcome of the Clearstream/Deutsche Borse talks. UBS had constructive talks with Clearstream management yesterday. UBS believes this strategic decision is in the best interest of our customers, of our group, and of the capital markets in Europe.” But the threat had to be taken seriously by Clearstream. If UBS did defect, it would – following the decision of DKW to move its Bund business to Euroclear last year – mean that Barclays Capital is now the only major investment banking group to keep its business at Clearstream. “We constantly review our position in the light of market developments, as one would expect,” says the British bank, tersely. But exactly how much would it matter if even Barclays Capital was lost? Clearstream wants to keep the business, and spent a day trying to persuade UBS to stay. But it would not matter that much if they lost it. JP Morgan Chase and UBS are just two out of 2,500 clients. The Euros 150 billion JP Morgan Chase is taking away may seem a lot of money, but it is only 2 per cent of the Euros 7.4 trillion Clearstream has on its books. And JP Morgan Chase is not in a position to shift its German equity business from Clearstream Frankfurt anyway, since there is no alternative to using the German CSD. Likewise, UBS accounts for about 3 per cent of total assets at Clearstream. Moreover, it is easy to think of a number of large and influential German banks, such as Deutsche, Hypo Vereinsbank and (ironically) even Dresdner Bank, who might actually shift assets from Euroclear to Clearstream. Many smaller Continental banks, whose presence in the securities trading and financing arena is increasingly significant, are already closer to Clearstream than they ever will be to Euroclear. And however angry some London-based investment bankers feel, they will all have plenty of clients who remain happy to keep assets with Clearstream. So the JP Morgan Chase decision is at least premature – since Deutsche Borse has yet to table a formal offer to the Cedel International shareholders and is not obliged to do so until its exclusivity rights expire on 31 January – and may be relatively unimportant. UBS acknowledges that defecting now would be premature, and other banks are known to be postponing a reassessment of their relationship with Clearstream until the outcome of the talks with Deutsche Borse is known. Unsurprisingly, given the closeness of relations between Euroclear and JP Morgan (until 2000 Morgan operated the Euroclear system, trousering $250 million a year for its trouble), Clearstream senses its rival in Brussels has launched a dirty tricks campaign by encouraging bankers already close to its view of the world to make the merger with Deutsche Borse look unpopular or even unviable in the run-up to 31 January with a series of well-spaced defections. Certainly these would-be defectors would be more credible if they had agitated for Euroclear to make a killer bid for Clearstream in the weeks before Christmas. The Brussels-based clearer may have raised its bid ostentatiously at the last minute, but its mix of cash for the Deutsche Borse and stock for Cedel International shareholders was scarcely designed to wow the right 50 per cent at Clearstream.Clearstream can plausibly argue that the vertical versus horizontal dichotomy is over-simplistic anyway. The Euroclear case for a merger with Clearstream (and other CSDs) rests mainly on the elimination of multiple interfaces in the back offices of the major investment banks. But the bulge bracket banks are not the only trading and investing houses which matter in Europe. Smaller domestic players want to keep the local CSDs. The elimination of multiple interfaces also depends as much on consolidation per se as it does on the direction of the consolidation. And not only has Clearstream never said it opposes further consolidation of depositories in Europe, it can also point to the Euronext grouping (to which Euroclear is linked) as not hugely different to the vertical platform Deutsche Borse wants to build. In the short run, vertical integration will almost certainly deliver cost efficiencies faster than a long drawn-out process of horizontal integration, and in the long run competition is always and everywhere the best means of securing efficiency and low prices. No wonder vertical integration is not as counter-cultural as Euroclear and its investment banking friends pretend: it is common in Asia and was recently adopted by the Helsinki stock exchange in Finland. Nor is continuing competition between ICSDs necessarily a negative outcome. The recent study by the Centre for European Policy Studies concluded that a single European CSD – akin to the Depository Trust & Clearing Corporation (DTCC) in the United States – was “not necessarily cheaper than competing organisations.” A merger of ICSDs would certainly do nothing to improve efficiency in European equity clearing and settlement, where agent banks reign supreme. Given that the ICSDs cannot centralise the settlement of equity transactions (which remain overwhelmingly domestic) without alienating that army of smaller broker-dealers and fund managers in every market in Europe whose interest in cross-border business is minimal, the ICSDs are in reality offering European equity traders and investors no more than an alternative to agent banks as a way into domestic CSDs. They will rightly be tempted to stick with agent banks, who offer a broader range of asset servicing products than the ICSDs in markets where the cultural, habitual, regulatory, fiscal and legal barriers far outweigh the infrastructural as business inhibitors. As the politics of clearing and settlement in Europe heat up, it will become increasingly obvious that Euroclear is more popular in investment banking circles than it is among the agent banks. This could be a decisive factor in the outcome. ********************************************************************************************************************Comment:The underlying technologies required for improving settlement timings are broadly similar whatever the accounting deadlines imposed. The article does not recognize that maturing technology is a key part of this equation. Orchestrating web services is an inflection point in supply and value chain integration. This will reduce the technology costs significantly by separating the business analyst from dependence on the IT developer. CSDs and CCPs are important…the market infrastructure does need to evolve…but advances in technology are equally relevant. The underlying technology change is driven by a continual move towards more application integration to reduce back office costs – the difference since Y2K is that new web-based standards allow organizations to use one infrastructure for internal integration, integrating with external business partners and also connecting with customers. Y2K only made pre-existing systems compliant and the underlying process and systems change was limited to reduce overall project risk. Many organizations still have large client-server systems (albeit Y2K compliant) which need to be broken down into their constituent functionalities and exposed to the settlement flow. The new generation of XML Web Services enables older legacy systems to expose their services so that system replacement decisions can be made separately from infrastructure decisions (and settlement deadlines). that financial advisors can also use Risk Analyzer when working with clients. GC.com: 1. Is Andersen Consulting right to argue that the case for T+1 in a bear market has yet to be made?2. Is the Andersen Consulting alternative of settlement on T+2 with same day trade confirmation a viable and effective step towards settlement on T+0? Broad-based domestic equity ETF assets jumped to $71.77 billion at the end of December, compared to the $68.52 at the end of November, while domestic sector funds were up slightly to $8.2 billion from $7.74 billion a month earlier. Global funds were up to $3 billion from $2.58 billion over the period.The ICI report includes 35 broad-based domestic equity ETFs, 33 domestic sector focused funds, and 34 global ETFs.Statistics contained in the monthly ETF report have been obtained from information provided to ICI by ETFs. Trust-issued receipts, such as Holding Company Depository Receipts (HOLDRS), are not included in the report because registered investment companies do not issue them. GlobalCustodian.com: Are the threats this week by leading banks to switch business from Clearstream to Euroclear in protest at the failure to achieve a horizontal alignment of the two ICSDs a sufficient argument against the full vertical integration of Deutsche Borse and Clearstream? The rationale for horizontal versus vertical structures is a commercial issue and not a polemic one. Horizontal structures enable the markets to build not for profit utilities with strong user based governance. They allow economies of scale both in management, staff and technology.Vertical structures that integrate trading, clearing and settlement, best typified by the proposed Deutsche Boerse model, seek to commingle the shareholder value driven world of the listed company with a monopoly arrangement post trade. Despite all promises that this monopoly will be benign, the fear is that it will be used to promote shareholder value at the expense of user interest.Were there multiple choice- and real choice- at all levels of the vertical structure, the market would be willing to see this model operate alongside others. But, at the moment, that choice is not really there except in the international bond activities of the ICSD’s.It is questionable whether user dislike for the vertical structure will lead to new thinking by Deutsche Boerse. Much may depend on shareholder reaction. Like all listed companies, the driver for strategy will be closely linked to the valuation placed on the company by the market. It will be interesting to establish whether others will follow the proposed moves of Chase and UBS. It is also, of course, possible that some clients may move the other way. The Chase and UBS thinking will, in part at least, have been driven by commercial realities. Scale gives fee discounts and they both have strong relationships with the two ICSD’s due to mergers. UBS was the Clearstream house as was Chase. J P Morgan was the Euroclear house as was Warburg. Consolidation could thus also be economically advantageous for the two houses.The news though undoubtedly poses problems for Clearstream. Losing two of ones top clients automatically weakens a company. It also will hit morale in Luxembourg. The converse is the case for Euroclear.It is that weakening of morale that is the key issue for users. Financially, earnings may suffer a glitch. But key staff retention remains the big issue for Clearstream management. Its top management has been decimated, the users and press have been critical of its culture (and its ethics) and now it faces up to the possible loss of two key non-executives on its board.The market will be concerned if this leads to further key person loss. Clearstream Luxembourg and Frankfurt are critical components of the market infrastructure. Performance degradation, perhaps due to loss of skill sets and focus, poses the greatest threat to market stability.Logic calls for consolidation in Europe. But consolidation must mean removal of layers of management, closure of facilities and consolidation of IT platforms. To date, there is little evidence of this happening. Fees in Europe need to reduce and reduce substantially. For the major holders of assets pay an exorbitant share of the costs of the big ICSD’s through ad valorem fees and non-competitive pricing of cash accounts. Holding a simple Eurobond is totally out of line with the equivalent cost for a domestic bond (CREST, for example, charges nothing). Cash balances are unremunerated and cash management tools complex. The ICSD’s and many in the market focus on the cost of a transaction. That serves well the high volume transaction houses. But for the non-broker dealers, the ICSD’s are a costly problem. And consolidation of infrastructure and user based governance must lead to fee cuts in those areas of excess charging and not just in the often quoted transaction fee. For that fee contributes perhaps around 15% of the ICSD’s gross income. Transaction cost cuts may provide useful headlines but they do little to tackle the issue of the total cost of our relationships with the ICSD’s. 1. It is very curious that several of the major firms who were pushing for a Clearstream / Euroclear merger on the grounds of “economies of scale” were the same firms who found it necessary to create the GSTPA o the grounds of “competition is good”.2. Vertical reintegration has really gathered pace in Asia and Australia in Hong Kong, Australia and Singapore. In those markets there is an absolute belief that the only way top achieve real economies and efficiencies is the total integration of the trading and settlement activities. This makes perfect sense and I predict that it is these markets that will leave Europe and the US embarrassingly behind by actually doing what is said cannot be done. Global Custodian: It emerged yesterday that Global Crossing, the telecommunications company to which SWIFT out-sourced its networks in February 2001, has filed for protection from its creditors under Chapter 11 of the US bankruptcy code. Do you think SWIFT took an unwarranted business risk in out-sourcing network provision (a) to this company and (b) to any company at all? The adverse financial position of Global Crossing has been known for some time and SWIFT had a contingency plan in place well in advance of the event. They have advised of the steps they will be taking to ensure stability of the network and we have, at the current time, no reason to doubt that these will be effective.The decision to outsource its network was made for sound commercial reasons. SWIFT has, over the years, become much more than a network. In fact the network was a commodity with the value added being in the security, the messaging and, above all, the connectivity. The events around Global Crossing do highlight though the need to ensure the financial stability of one’s outsource partners. The entry into Chapter 11 of Global Crossing is symptomatic of the unprecedented malaise that has hit many telecommunications organisations.The reality is that SWIFT, as a major client of Global Crossing, will now have to consider how to work with the successor organisation. Given the critical nature of the network, it may have to examine whether it needs to consider added contingency arrangements. However, such contingency could be costly and it is unclear how effective it would be.SWIFT is required to ensure that its service offering is cost effective. It therefore is forced to look at ways of reducing the cost of the commodity component of its service.The reality is that the events around Global Crossing appear to be a problem for SWIFT but, in no way, a mission critical one. However, it does highlight the need for careful selection of partners, especially where there is no automatic alternative supplier available to replace the partners in the event of an unforeseen contingency. It is very easy to be critical of SWIFT for a whole number of reasons not least of which was the SIBOS debacle last year referred to in the article. I could hardly be accused of being a great SWIFT fan myself. However, I find it hard to find fault with SWIFT in this instance. Its deal with Global Crossing was a surprise to many people because for the first time SWIFT were acting like a real company making real company decisions based on real company criteria. Criteria such as cost, speed to market, build or partner? The surprise was less about the decision itself and more about the organisation making it.For years SWIFT has been lambasted as slow, bureaucratic and out of touch with the real world and with good reason. There have been calls to restructure, realign, refocus and be responsive in the press, industry gatherings, even from the platform at SIBOS itself. The saying goes that you have to be careful what you ask for you might just get. SWIFT made the decision to outsource for all of the right reasons including speed to market and cost and most importantly it made a decision. Furthermore it appears to have put in place detailed contingency plans in the event of Global Crossing experiencing difficulties. It should be commended for all those reasons and not criticised. Whether SWIFT are liked or not, they are a key infrastructure player in the financial markets and at least for the time being their existence is very important.As to their choice of vendor, they are guilty of negligence. But then again only as much as Enron shareholders, BCCI depositors and tourists stranded at airports after their travel companies go bust. My hope coming out of this is that SWIFT continues to do these kinds of deals, as their reverting to their old ways would be too depressing to contemplate. A fully-automated annuity application processing system that represents a major advance for the insurance industry and promises to lower costs and speed the growth of the annuities market has been launched by The Depository Trust & Clearing Corporation (DTCC) and Pivot/Info-One.The system, using Pivot/Info-One’s InfoSource Solution and DTCC’s Insurance Processing Service (IPS), allows insurance representatives at various financial organizations, including broker/dealers and banks, to complete on-line annuity applications at their desks or even from a laptop in a customer’s home and pass them directly to the insurance carrier. This speeds the application, eliminates costly manual procedures and dramatically lowers processing costs. “This service brings us closer to mainstreaming insurance products by taking what was a time-consuming, paper-based, manual procedure – that could take days or even weeks to complete – and turning it into an automated process that can be completed within 24 hours,” said J. Randall Grespin, managing director for Distribution Services at DTCC.”It provides broker/dealers with the tools they need to sell and process annuities effectively and efficiently and creates an additional source of revenue for them,” said Grespin.Pivot/Info-One and IPS began processing annuity applications for First Union Securities in January, sending the completed applications to Hartford Life, Inc. More than 7,750 financial advisers at First Union will be equipped with the annuity applications technology.The InfoSource software walks a registered insurance representative through a logical series of choices, helping to ensure the accuracy of customer information throughout the sales process. It also houses all of the product and carrier-specific information needed to help make sure that the annuity contract is correct and that financial transactions are handled for all involved parties. The completed application is then sent through IPS to the carrier. Same-day money settlement is handled through the IPS money settlement system.DTCC’s IPS provides an automated, centralized system that electronically links insurance carriers with broker/dealers, banks, and financial planners for the exchange of information and money settlement during the sale and support of variable and fixed-rate annuities and life insurance products.”By utilizing our Web-based, front-end system in conjunction with IPS’ annuity processing, broker/dealers will discover how easy and fast it is to process an annuity,” said Lou Hensley, co-president, Pivot/Info-One. “This will certainly help fuel the growth of the annuity market.””At First Union, we anticipate this new system will help us transact more business with our current broker force and at the same time enable us to become efficient as we grow,” said Richard Randa, senior vice president of annuity marketing, First Union Securities. “By connecting to DTCC via InfoSource, the transaction will be totally automated and money settlement will be much easier.”In my opinion, this system will get more brokers to sell annuities because trades will be more transactional in nature, less confusing, and the system will allow broker/dealers to track all the annuity business they do,” Randa said.In addition to First Union, Pivot/Info-One will supply its front-end technology to the SunAmerica Financial Network, providing more than 13,000 registered representatives with the Web-based annuity processing system. SunAmerica is also an IPS client. SEI Investments, which distributes as well administers mutual funds on behalf of banks and fund managers, has defied falling equity markets to post record earnings figures. 2001 revenues are up 10 per cent to $658 million, and operating profits 24 per cent to $198 million. Assets under administration now total $257.9 billion, of which $77.5 billion are also under management. Rumours that AMP is keen to sell Cogent Investment Operations Limited have circulated ever since the Australian life company set up the separately branded fund administration subsidiary. Now they have re-surfaced, with Mellon Trust touted as the likeliest buyer. As a prospective buyer, the American bank is certainly a logical candidate. It has ambitions in fund administration, but an insufficiency of clients to achieve economies of scale, and Cogent has 140 billion of assets under administration. But are the Australians willing sellers? Cogent has been more successful than its inventors expected. It is generating revenues not far short of 100 million a year, with a portfolio of services aimed at the fund management niche from which it originally emerged way back in 1990 from the Henderson back office (as Henderson Investment Services). Obviously, two thirds of the assets in administration are in-house monies of its Australian parent. But Cogent has also picked up not only acquisitive and fast-growing UK fund managers such as Aberdeen Asset Managers but – by opening an operation in Luxembourg – also good European names such as Vontobel and Raffeissen. 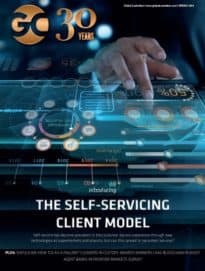 Its third-party business has grown faster than its internal business.The difficulty for Cogent is that it is competing for clients in a market stuffed with custodial competitors willing to give administration away in return for getting paid in other ways (such as securities lending). Against raw pricing considerations, Cogentesque arguments about custodial choice and unbundled best-of-breeds are not always as persuasive as they should be. Indeed, Cogent might well be advised to form a partnership with a particular custodian to plug this gap in its armoury, and no custodian likes partnerships better than Mellon. It is certainly known to have had conversations with custodians about working together to provide an integrated custody and fund administration service.But a healthy track record, and an obvious way out of a strategic dilemma, does not mean Cogent is not for sale. Inevitably, a decision to sell Cogent will owe more to the wider strategic ambitions and imperatives of AMP than it ever will to the senior management of Cogent. The sale and distribution of UK mutual fund is a festival of low-tech solutions, high overheads, data re-keying and poor customer service. Or so says a new report on the industry by consultants Cap Gemini Ernst & Young. At one level, this is a re-statement of the obvious – the director general of the Association of Unit Trusts and Investment Funds (AUTIF) admitted as long ago as 1996 that the mutual fund industry was “among the worst service providers in the world” – but the new report itemises just how bad things have remained despite this widespread realisation. It found that just one in fifty IFAs (who still dominate fund distribution in the UK) use extranets on a daily basis. Data arrives from fund managers in a jumble of formats, with different time stamps, making it impossible to provide clients with consolidated, up-t-date information. Most purchases and sales are still agreed over the telephone, and necessitate constant re-keying. A jumble of payment methods leads to days of wasted time as distributors try to reconcile their accounts with providers. The answer, predictably, is standardisation: of information exchange, transaction processing and payment methods. In short, the UK would benefit from a version of Fund/SERV, the DTCC service which has standardised communications between fund managers and fund distributors in the United States, and which Euroclear (with FundSettle) and Claerstream (with Vestima ) are looking to reproduce in Europe. CSFB announced today that it was putting aside US$100 million to fund the settlement reached with the Securities and Exchange Commission (SEC) and the National Association of Securities Dealers Regulation, Inc. (NASDR) over their investigation into IPO allocation practices at CSFB. It was alleged that CSFB brokers had demanded excessive commissions from hedge funds in exchange for higher allocations in hot IPOs. The figure is dwarfed by US$745 million CSFB is spending on restructuring costs, most of it (US$583 million) to shrink the head-count, including shedding the burden of the notorious guaranteed contracts given to hires by the previous CEO. Credit Suisse Group announced that it expects to report a net operating profit of approximately CHF 4.0 billion for 2001, and a net operating profit of approximately CHF 0.6 billion for the fourth quarter, excluding one-time charges at Credit Suisse First Boston and amortization of goodwill and acquired intangible assets after taxes. The Group expects a net profit of approximately CHF 1.6 billion for 2001, and a net loss of approximately CHF 0.8 billion for the fourth quarter. The one-time charges at Credit Suisse First Boston relate to the previously announced cost reduction initiatives and the settlement of the SEC’s and the NASDR’s investigations into certain IPO allocation practices, and aggregate approximately CHF 1.1 billion (USD 646 million) after taxes. The Group’s financial services, private banking, and asset management businesses continued to perform well and showed strong momentum in 2001.Based on preliminary results, Credit Suisse First Boston expects to report a net operating profit of approximately USD 338 million (CHF 570 million) for full year 2001, and a fourth quarter net operating loss of approximately USD 196 million (CHF 328 million), excluding the after-tax one-time charges of approximately USD 646 million (CHF 1.1 billion) and the after-tax amortization of goodwill and acquired intangible assets. Credit Suisse First Boston expects to report a net loss of approximately USD 961 million (CHF 1.6 billion) for full year 2001 and a net loss of approximately USD 1.0 billion (CHF 1.7 billion) for the fourth quarter.Excluding the after-tax one-time charges at Credit Suisse First Boston as well as the after-tax amortization of goodwill and acquired intangible assets, Credit Suisse Group expects to report a net operating profit of approximately CHF 4.0 billion for full year 2001 and a net operating profit of approximately CHF 0.6 billion for the fourth quarter. The Group expects to report a net profit of approximately CHF 1.6 billion for full year 2001, and a net loss of approximately CHF 0.8 billion for the fourth quarter.Lukas Mhlemann, Chairman and Chief Executive Officer of Credit Suisse Group, said: “Our preliminary results demonstrate the resiliency and strength of our financial services, private banking, and asset management businesses. Although some of the actions we took at Credit Suisse First Boston had a negative impact on our short-term financial results, they have allowed us to take great strides forward in enhancing the business unit’s competitiveness. Given the progress at Credit Suisse First Boston, all of our businesses are better positioned than ever to meet the challenges of a demanding market and capitalize on our many opportunities for growth.” John Mack, Chief Executive Officer of Credit Suisse First Boston, said: “While we still have much work to do, we made important progress at CSFB during 2001 bringing costs more in line with the market and our competitors, resolving outstanding regulatory matters and making our firm more competitive. Going forward, we remain intensely focused on enhancing profitability, creating a stronger, more unified culture and delivering a superior level of service to our clients worldwide. These are the critical steps necessary to achieve our ultimate goal of creating the world’s premier investment banking firm.”The pre-tax one-time charges at Credit Suisse First Boston totaling approximately USD 845 million (CHF 1.4 billion) are comprised of the following major items:- Charges of USD 745 million (CHF 1.3 billion) relating to restructuring in connection with the previously announced cost reduction initiatives. These charges increased by USD 95 million (CHF 161 million) over previously disclosed estimates due to incremental headcount reductions. Of these charges, approximately USD 583 million (CHF 985 million) relate to personnel costs (approximately 20% of which relate to guarantees and retention awards for fiscal years 2002 and 2003), approximately USD 103 million (CHF 174 million) relate to facilities, and approximately USD 59 million (CHF 100 million) primarily relate to exiting non-core businesses.- A provision of USD 100 million (CHF 169 million) for a settlement reached with the U.S. Securities and Exchange Commission (SEC) and the National Association of Securities Dealers Regulation, Inc. (NASDR) in respect of their investigations into certain IPO allocation practices. The cumulative tax benefit for these items is expected to amount to approximately USD 199 million (CHF 336 million), resulting in an after-tax impact of approximately USD 646 million (CHF 1.1 billion).Credit Suisse First Boston’s fourth quarter results were also significantly affected by weaker fixed income revenue, pre-tax losses of USD 213 million (CHF 360 million) related to Argentina, pre-tax losses of USD 126 million (CHF 213 million) related to Enron, and pre-tax private equity write-downs of USD 104 million (CHF 176 million).Credit Suisse First Boston’s results also reflect credit provisions – excluding Argentina and Enron – of USD 339 million (CHF 573 million) in the fourth quarter. The increase in provisions reflects deteriorating credit market conditions. Aggregate credit provisions for the full year 2001 total USD 718 million (CHF 1.2 billion).Credit Suisse Group’s other business units continued to perform well:- Credit Suisse Financial Services expects to report a 2001 net operating profit of approximately CHF 1.4 billion (approximately CHF 1.8 billion excluding losses stemming from the investments in its European Financial Services Initiative);- Credit Suisse Private Banking expects to report a 2001 net operating profit of approximately CHF 2.3 billion, and;- Credit Suisse Asset Management expects to report a 2001 net operating profit of approximately CHF 0.3 billion.The asset gathering businesses maintained strong growth momentum in 2001 with net new assets for the Group totaling approximately CHF 66.5 billion, of which Credit Suisse Private Banking contributed approximately CHF 33.1 billion.Thomas Wellauer, Chief Executive Officer of Credit Suisse Financial Services, said: “Credit Suisse Financial Services and Credit Suisse Private Banking performed well in the challenging environment. Thanks to the merging of the two business units, we have achieved a segmentation that is geared even more closely to the needs of our clients. This move also enables us to transfer the expertise available in Switzerland more effectively to our growth initiatives in Europe and to eliminate overlaps in support areas.”Overview of Expected Full Year 2001 Results Detailed results will be disclosed on March 12, 2002, with the Group’s 2001 year-end earnings announcement.Additional Information on Financial ReportingExcept as noted, the results referred to herein are prepared based on Swiss generally accepted accounting principles, which Credit Suisse Group uses for its quarterly and annual reporting. Is Deutsche GSS Safe in The Hands of the Investment Bankers? The first results announced by Deutsche Bank since it started reporting to GAAP standards were not flattering. Pre-tax income fell by Euros 5.1 billion to Euros 1.8 billion. EPS plunged from Euros 22 in 2000 to just Euros 0.27 last year. Return on capital was close to zero, after falling just short of 40 percent in 2000. A fall in gains from the sale of industrial holdings, some duff real estate and private equity investments, plus bad debts (Euros 500 million) and restructuring costs (Euros 200 million), account for most of the damage. But competitors in the securities services industry are wondering just how large a contribution the custody and fund administration divisions made to a truly dreadful year. Needless to say, the figures cannot be found in the official announcements. As part of the Global Transaction Bank (GTB), itself part of the Corporate and Investment Bank Group (CIB) – one of the two main divisions of Deutsche Bank – the results of the Global Securities Services division (GSS) are lost in the net revenues reported by CIB of Euros 17.4 billion.But if the equity trading desks and asset management arms took a hammering from falling market values- and they did – GSS must have suffered a double whammy, since its own earnings are based on a mixture of transaction-based and ad valorem fees. Indeed, GSS probably suffered a triple whammy if the haemorrhaging of accounts from the former Bankers Trust custody business in the United States and its WM fund administration arm in Edinburgh is taken into account. These losses are likely to have been offset by higher earnings from securities lending and cash management. The current best guess in the marketplace is that the custody and fund administration businesses made a net loss of Euros 250 million in 2001, partially offset by a good year in securities financing and cash management. Apparently, GSS is unaffected by the management reorganisation which accompanied the Deutsche Bank results. The reorganisation as a whole is generally being interpreted as giving the largely American investment bankers who run Global Markets (Anshu Jain), Global Equities (Kevin Parker), Corporate Finance (Michael Cohrs) and Asset Management (Michael Philipp) greater control over the strategy of the bank as a whole. Their views of GSS are unknown, if they have any. Although a German, Juergen Fitschen, remains in charge of the Global Transaction Bank, he is no longer a member of the slimmed-down Vorstand. Alternative investment firm Tremont Advisers has hired John J. Hock as an SVP and Director of Institutional Sales, as the firm ramps up its focus on the delivery of hedge fund products to institutional customers, including pension funds, endowments, foundations – and the consultants who work with them. Hock joins Tremont from Alpha Investment Management. First Republic Bank on Friday decided to acquire the 82% of LA-based convertible bond manager Froley, Revy Investment Company it does not already own. Froley, Revy manages in excess of $2 billion in assets for public and corporate pension funds, insurance companies, endowments and foundations, high net worth individuals and broker/dealer managed account programs. ING Pilgrim Securities has launched two new value funds, the ING MidCap Value Fund and ING SmallCap Value Fund, both of which are sub-advised by Brandes Investment Partners, L.P. Global Crossing, the telecommunications firm that recently filed for bankruptcy, now says that the SEC wants to investigate its accounting practices. At issue are 20-year contracts for telecommunications capacity, so-called indefeasible rights of use, or IRUs, which carriers frequently swap with one another. And yes, its auditor is Arthur Andersen. Global Crossing issued more details on previously reported allegations by a former employee regarding the company’s accounting practices.In August 2001, Global Crossing received a letter from Roy Olofson, who was at that time a vice president-finance of the company, raising concerns about certain accounting and financial reporting matters of Global Crossing and its subsidiary Asia Global Crossing. Mr. Olofson claimed that it was improper for the company to have reported pro forma values for cash revenue and adjusted EBITDA (earnings before interest, taxes, depreciation and amortization) because the numbers are not measures of cash receipts or earnings and because the amounts were allegedly inflated by including amounts for which cash was not received or where there had been non-monetary exchanges of capacity.After a review of the letter and consultation with outside counsel, the company determined that the financial and reporting topics raised in the letter had been reviewed by its internal finance and accounting personnel and by Arthur Andersen in connection with the audit of the company’s annual financial statements and its review of the company’s interim financial statements. The company also determined that there had been appropriate disclosure in the company’s press releases and filings with the U.S.Securities and Exchange Commission (SEC) describing how the pro forma numbers were prepared and making it clear that this information should not be considered as an alternative to any measure of performance defined under GAAP (generally accepted accounting principles). The company also determined that there were reasons to question the motives of Mr. Olofson. Accordingly, no further action was taken in response to Mr. Olofson’s allegations.As disclosed in the company’s filings with the SEC, the company’s management has used recurring adjusted EBITDA to monitor compliance with the financial covenants contained in its debt instruments and to measure the performance and liquidity of its business segments. The company’s press releases and filings with the SEC have also disclosed the fact that the company has purchased significant amounts of assets from carriers who were also customers of the company. The disclosures have presented the amounts of cash received by the company and included in cash revenue and adjusted EBITDA, as well as the amounts of the cash commitments to those customers.Shortly after Mr. Olofson wrote to the company, and notwithstanding the fact that he was still an employee, the company received a letter from an attorney alleging that Mr. Olofson had been “constructively terminated” from his employment and therefore would no longer be reporting to work. Furthermore, the employee and his counsel demanded, as a condition to dropping his wrongful termination claim, an up-front multi-million dollar payment and a minimum seven figure annual cash compensation package for a five year period. After a review of this claim and consultation with outside counsel, the company concluded that this claim was without merit and refused to agree to this demand.Subsequently, Mr. Olofson’s attorney provided the company with a draft complaint which elaborated on the allegations expressed in the employee’s August 2001 letter and added an allegation that the company had delayed the announcement of a downward revision of its guidance for 2001 earnings because of recent stock transactions entered into by senior executives of the company. After a review of these additional allegations and consultation with outside counsel, the company concluded that the allegations were without merit.The company continued to refuse to agree to the employee’s multi-million dollar demand and, over the following months, the employee’s attorney gradually reduced his settlement demand to an amount representing less than one-tenth of the original demand. The company terminated the employee’s employment on November 30, 2001 in connection with a substantial reduction in its workforce.On January 18, 2002, the company received a letter from a different attorney for Mr. Olofson, attaching a revised draft of the initial complaint and containing renewed threats to commence an action for wrongful termination against the company and certain of its officers and directors unless a multi-million dollar payment was made by February 1, 2002. The company again refused to agree to this demand.Although the company had determined that the allegations made by Mr. Olofson were without merit and that the issues raised in his letter had been properly addressed in the company’s news releases and its filings with the SEC, the company’s January 28, 2002 bankruptcy filing and recent events not involving the company have created a heightened sensitivity to any alleged accounting improprieties. Accordingly, on January 28, 2002, the company first disclosed to Arthur Andersen the existence of Mr. Olofson’s letter and on January 29, 2002 provided a copy of the letter to Arthur Andersen. On January 29, 2002, the company also first disclosed the letter’s existence to the current members of the company’s audit committee and on January 30, 2002 provided copies to these individuals.The company has provided a copy of Mr. Olofson’s letter to the SEC and has received an inquiry from the SEC for the voluntary production of certain additional information regarding the issues raised in Mr. Olofson’s letter. The company is cooperating with the SEC in providing this information. Although the company continues to believe that Mr. Olofson’s motivations are questionable and continues to believe that its accounting and reporting are entirely appropriate, at the request of the company’s audit committee and Arthur Andersen, it has decided to form a special committee of independent directors, including members of its audit committee, to conduct a further review of the allegations made in the August 2001 letter and related draft complaints. The special committee will retain independent counsel and a firm of independent accountants other than Arthur Andersen to review the matter. Ariel Capital Management has launched a new large cap growth offering, Ariel Premier Growth Fund. This fund, sub-advised by Lincoln Capital Management, will invest in the stocks of companies with market capitalizations that generally exceed $10 billion at the time of purchase. Calvert has launched the Calvert Short Duration Income Fund, an actively managed short-term corporate bond fund that employs a relative value strategy to produce incremental income. Calvert Asset Management Company manages the Fund. Mazama Capital Management has opened its Small-Mid Cap Growth separate account product to new institutional investors. The Small-Mid Cap Growth product is Mazama’s second product offering. Montrusco Bolton Investments has launched the Montrusco Bolton Focus Global Fund Ltd., a new multi-manager hedge fund. According to the firm, the fund can qualify as a Canadian asset for investment purposes, and is expected to raise $100 million this year. Custodial clients of Allied Irish Bank, a commended provider in the Irish market in the Global Custodian agent bank review for several years, will be concerned about news today of the $750 million of losses racked up by a rogue trader. The sum is large enough to have brought the continuing independence of the bank into question, with a possible merger with Bank of Ireland now being mooted. Though – unlike Barings – the bank will survive, there will naturally be questions over the quality of management and controls at a bank which allowed an individual at an unexciting subsidiary such as Allfirst to run up exposures of this size in the foreign exchange market.Allied Irish Banks Plc said it lost $750 million after a trader in its Baltimore unit used bogus transactions to hide bad bets in the currency market. The Federal Bureau of Investigation is investigating reports of fraudulent trades at the bank’s Allfirst Financial Inc. unit, FBI officials in Baltimore said today. The company identified the trader as John Rusnak and said he couldn’t be located. Rusnak’s lawyer said his client is in Baltimore and no criminal charges have been filed.Shares of Ireland’s biggest bank plunged 17 percent, the steepest drop in more than 12 years. Allied Irish’s losses are the largest blamed on unauthorized trading since Sumitomo Corp.’s $2.6 billion in the copper market in 1996. That followed Nick Leeson’s $1.4 billion loss in derivatives trades during 1995 at Barings Plc, which his superiors failed to stop. STB Systems, specialists in financial compliance software, warns rogue traders will continue to damage banks around the world until investment is made in an inexpensive new technology. The company, which has advanced software systems that automate audit of data integrity, says systems are available today that could pick up reconciliation irregularities inherent in rogue trading before it gets out of hand.According to James Phillips, Business Development Director at UK-based STB, many banks must still be as exposed as AIB clearly were. “There is a way to detect non-compliant activity long before it’s a major problem,” said Phillips. “Since the Leeson case there has been huge investment in risk management technology and in regulatory pressure, yet many financial organisations clearly remain exposed to fraud or misstatement of financial condition.”STB’s software can interrogate any number of trading and accounting systems, reconcile positions, or other data that ought to match, and automatically alert management if they do not. Whilst in the AIB case it is too early to say what went wrong it is believed that fictitious option trades were used by the trader to offset failed foreign exchange transactions. If this is the case, then the software would be able to automatically check and immediately highlight anomalies between fictitious options data and non-existent balancing entries elsewhere – a process known as “continuous business audit”.”These software tools constantly sniff around inside a Bank’s systems and ring alarms if abnormal activity of is occurring,” added Phillips. “If trends change, profit centres are suddenly not profitable, or more fundamentally data in one system does not reconcile to another, systematic errors whether fraudulent or inadvertent are immediately flagged. This process could prevent a build up of rogue trading and protect financial institutions from the consequences of it.”The alternative to automated tools is hugely expensive manual auditing, says STB. “But often the manual audit comes far too late,” concluded Phillips.STB Systems Limited has provided automated financial compliance software for nine years. The company now holds a major share of the UK market for compliance and regulatory reporting solutions and has expanded into the rest of the world, quickly gaining leading positions from its operations in both New York and Hong Kong.STB software provides automated reporting for FSA-supervised firms, and is one of few to be recognised by the Bank of England for electronic reporting. The Average US Hedge Fund managed a 0.3% net gain in January, according to preliminary figures received by hedge fund advisory firm Van Hedge Fund Advisors International.Based on that return, January would be the fourth straight month of gains for hedge funds. And, if those estimates hold up, it would be the eighteenth month in the last two years that hedge funds have outperformed the S&P 500, according to Van Hedge.Over half of the hedge funds reporting so far were profitable last month, and over three-quarters beat the S&P 500, according to the report. Short Selling hedge funds were among the most successful in January as the ongoing Enron scandal spooked investors. Final January results for the Van Hedge Fund Indices, detailing the average performance for U.S., Offshore and Global hedge funds, by strategy, should be released later this month. The ICSDs and would-be ICSD the Depository Trust and Clearing Corporation (DTCC) were never going to like The Securities Settlement Industry in the EU, the report published in December by the Centre for European Policy Studies (CEPS). After all, it attacks the very foundation of their strategy in western Europe: that settlement costs are extortionately expensive and can be redressed only by consolidation of ICSDS and CSDs. The CEPS report estimated that the post-netting costs of cross-border transaction settlement within the European Union are just 1.86 times those of the United States; that the domestic CSDs are as cost-efficient as the DTCC; and that the ICSDs are easily the most expensive part of the European securities clearing and settlement infrastructure. “A centralised agency,” concluded the report, “is thus not necessarily cheaper than competing organisations.”An internal analysis of the CEPS report by DTCC officials does not spare its authors any invective. It is variously described as “a conclusion in search of a rationale,” “flawed,” “skewed,” “inconsistent,” and “erroneous.” DTCC rightly points out that a narrow emphasis on transaction costs excludes other benefits of centralisation – such as more efficient collateral management – but the nub of its own criticism of the CEPS study is equally narrowly based. Indeed, the litany of complaint from the DTCC depends entirely on the assertion that the methodology of the CEPS report was mistaken in being based (crudely speaking) on total operating income divided by the number of transactions settled after netting. According to DTCC this results in the following distortions:-Too much of DTCC’s income is included in the numerator. DTCC says only 32 percent of its total operating income came from clearing and settling securities transactions.–Too few transactions are included in the denominator. DTCC says CEPS under-estimates the number of transactions processed by using post-netting figures only, because on the best days at DTCC netting reduces the number of trades proceeding to settlement by as much as 97 per cent.In fact, the CEPS analysts were alive to these problems. But they were forced to compare settlement costs rather than settlement fees in this way because the fee structures charged by the CSDs and ICSDs vary hugely both on paper and in practice, since fees are adjusted for transaction types and the volume of business transacted by particular clients. At the ICSDs in particular, fees are also distorted by cross-subsidisation, complicating the choice of users buying a package of services at a single price. In short, the data to make fee comparisons does not exist, and cannot be derived from what is published. The DTCC itself admits as much, griping that “unfortunately CEPS does not use this opportunity to encourage a move towards price transparency and more simple fee structures in Europe.” This seems a particularly unkind way of reading a study which highlights the opacity of CSD and ICSD fee structures in the most comprehensive way possible.Secondly, far from insisting that the pre-netting calculation is the only fair way of looking at the problem, CEPS presents figures on both a pre- and post-netting basis. It concedes that relative clearing and settlement costs in Europe are considerably higher (at 7.75 times US levels) on a pre-netting rather than a post-netting (1.86 times) basis. The CEPS study also points out that the pre-netting multiple fall significantly (to 4.35 times US levels) if the high-cost ICSDs are excluded from the calculation. On a post-netting basis, operating income per transaction is almost one-to-one with the DTCC (1.08 times US levels.) It is hard to avoid the conclusion that DTCC has over-reacted, and that it has over-reacted because it finds the CEPS report unhelpful to its own commercial ambitions in Europe. But, like its mimesis Euroclear, DTCC is a past master at cloaking those ambitions in the language of the disinterested public servant. National Securities Clearing Corporation, a subsidiary of The Depository Trust & Clearing Corporation, has launched a new Web-based service, Fund/SPEED, which has the capability to allow mutual fund companies to provide – in real time – customer account information to their distributors, including the growing financial planner and financial representative industry.Fund/SPEED is a dynamic, standardized electronic platform that acts as an information gateway through which fund companies can send and receive information from a nationally based network of reps and planners. Up until now, the only way financial representatives and planners could obtain information on their clients’ mutual fund transactions and portfolios was through manual methods – phone and fax – or through multiple fund or transfer agent systems. “It’s a slow and expensive process,” said Ann Bergin, managing director for Mutual Fund Services at NSCC. “What Fund/SPEED does is provide a ‘missing link,’ using automation and the Web to bring the mutual fund manufacturer and distributor closer together. The service will strategically help funds grow their business partnerships because it’s so much easier to reach more distributors.”Fund/SPEED is being launched in two phases. In the first, and current, phase, account inquiry information is being transmitted through this link. This information includes:customers’ financial history, such as purchases, redemptions, distributions, adjustments and other financial activity information;fund position summaries and details, such as the accounts owned by a shareholder, number of shares and market value, and registration information;money transfer instructions;contingent deferred sales charge information, for example, free shares, CDSC shares, percentages and hypothetical calculations;Rights of Accumulation/Letter of Intent information, including ROA total values and LOI contribution amounts and effective/expiration dates;pending transactions – transactions that a fund has not posted into an account, and information identifying these transactions. With Fund/SPEED, which uses Extensible Markup Language (XML) as its Web-based interface, financial reps and planners can request information on multiple funds in a customer’s portfolio through their distributor, such as a broker/dealer firm, or through a service provider which, in either case, must be an NSCC member. That firm forwards the request to Fund/SPEED, and Fund/SPEED then distributes the request to all the funds automatically. The information is then channeled back from the funds through Fund/SPEED, to the service provider or broker/dealer and, ultimately, to the reps and planners. Currently, more than 50 fund companies are participating in Fund/SPEED. The first service provider to develop a link to Fund/SPEED is AdvisorCentral, LLC, a joint venture among Putnam Investments, Franklin Templeton, Fidelity, and PFPC Inc. “Along with other fund companies, we have jointly planned for an industry standard service like Fund/SPEED,” explained Kenneth Rathgeber, executive vice president and chief operating officer at Fidelity Investments Institutional Services (FIIS). “We now have the important capability to tie financial planners and the funds together directly in a more automated way. This is an opportunity to standardize the process for requesting and supplying account level information between FIIS and our distribution partners, while reducing costs and increasing operating efficiencies at the same time.”In the second stage of the service’s rollout, scheduled for later this year, Fund/SPEED will allow for further automated information exchange between funds and reps and planners. Using the Fund/SPEED link, reps and planners will be able to send fund purchase, redemption and exchange orders to NSCC’s members for routing – through Fund/SPEED – into NSCC’s Fund/SERV system, where the orders will be processed. (Fund/SERV is the industry standard for centralized, automated mutual fund order entry and settlement.) Actual settlement, however, will be completed outside the clearing corporation process, by the distributors and funds directly. This may be done through the Automated Clearinghouse (ACH), or through any other means they may agree upon.Membership RequirementsFinancial reps and planners can link to Fund/SPEED’s inquiry functionality through their distributors that are settling members of NSCC. For those distributors that are not NSCC members, NSCC has developed a new Data Services Only (DSO) Member category that does not carry the same capital requirements that a settling member must meet. DSO members are eligible to access only certain data and information services of NSCC and are not permitted to settle any transactions through NSCC’s facilities. Daniel V. Szemis, who ran Merrill Lynch’s $2.8 billion Small Cap Value Fund since 1996, has left the firm to work at a hedge fund, according to Reuters. Elise Baum, who joined Merrill Lynch Investment Managers in 1993 – and is already a portfolio manager of the Merrill Lynch Mid-Cap Value Fund and Merrill Lynch Global Technology Fund, will replace him. Baum took over the latter in mid-December after fund manager Paul Meeks left Merrill Lynch. Real Assets Investment Management Inc. unveiled its Social Leaders Fund, which invests in companies committed to environmental and social improvements.According to Real Assets, the targeted companies demonstrate the financial benefits of strong social leadership through their progressive policies, practices, products and services. To date, the Social Leaders Fund has invested in 25 companies from Canada, the US and abroad. It will eventually hold up to 50 companies. Some of the names held by the fund include:Cisco Systems, which offered its laid off employees the option of working for a non-profit organization for one year with Cisco paying a third of the worker’s salary and the workers’ health benefits and stock options, Fannie Mae, which was named in 1999 by Working Mother magazine as among the ten best workplaces for working mothers, and Whole Foods, which was chosen as one of the 100 Best Corporate Citizen by Business Ethics magazine in 2001.